We use emojis to help us express emotions, but sometimes it’s the emojis themselves that bring them on. Exhibit A: 😭. That one is "OMG so funny I'm crying." The replies were heated and divided. Some crowed agreement that 😭 is downright inappropriate for condolences, as it howls with laughter—not tears. Others recoiled at the very thought, prescribing the emoji’s official name, Loudly Crying Face, as its one true meaning. Our passions now excited, let’s lower the temperature with some cool-headed, deep-breathing emojiology of 😭 Loudly Crying Face. 😭 Loudly Crying Face conveys uncontrollable feelings and overwhelming sentiments, ranging from grief and disappointment to hilarity and joy. Its tone is often meant to be hyperbolic. The emoji is not to be confused with 😂 Face With Tears of Joy, though it frequently gets paired with it and is used for the same effect. 😭 Loudly Crying Face is one of the originals, with roots in Japanese cellular carriers back in 1999. It came into wide release under Unicode 6.0 in 2010. 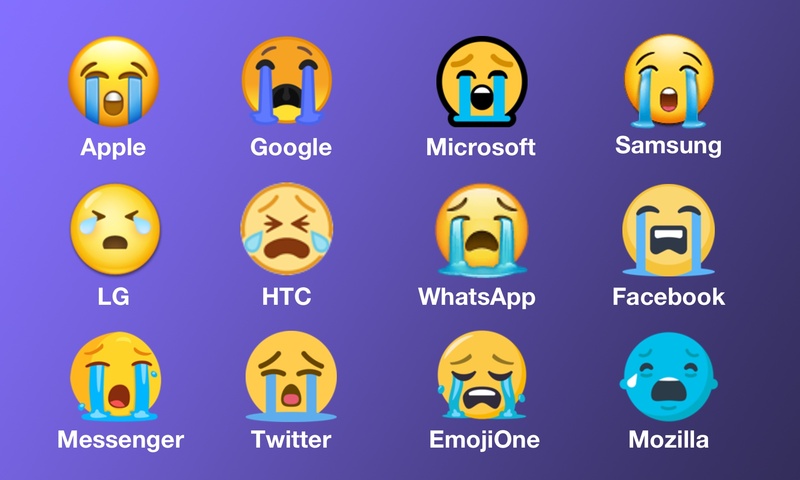 Since then, 😭 Loudly Crying Face has become one of the most popular emojis, far outstripping its blue brethren, including its neighbor on the Apple keyboard, 😢 Crying Face. In 2015, 😢 Crying Face ranked as the third most used emoji on Twitter, outpaced by the uncatchable No. 1 😂 Face With Tears of Joy and No. 2 ❤️ Red Heart. It clinched another impressive bronze in 2017 on Apple devices, again looking up to 😂 Face With Tears of Joy and ❤️ Red Heart on the podium. On most platforms, the not-so-smiling smiley 😭 Loudly Crying Face is yellow-faced and open-mouthed, as if inconsolably bawling or sobbing—two other common names it goes by. Down its cheeks rush two heavy streams of tears, which collect into a pitiful pool on the likes of Twitter and Facebook. 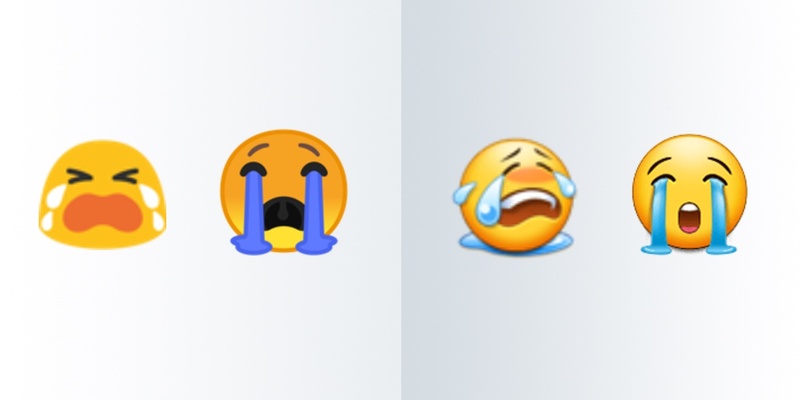 Above: The Loudly Crying Face emoji is becoming increasingly similar across platforms, with two streams of tears running down its face. HTC and LG stick with teardrops and Mozilla opts for a blue face. There are some notable exceptions, though. On HTC and LG, 😭 Loudly Crying Face features squinting eyes shedding two teardrops. Perhaps the tech companies will take a cue from Samsung and Google, who've brought their versions of the emoji in line with Apple’s twin cascades in recent updates. Above (left to right): The Loudly Crying Face emoji on Google Android 7.0, Google Android 8.1, Samsung TouchWiz 7.1, and Samsung Experience 9.1. Mozilla, as ever, is the outlier among major vendors, its 😭 Loudly Crying Face shedding a single tear from a blue face, a convention it uses for other sad or stressed-out smileys. While Apple’s emoji-craft so often leads the way, perhaps its 😭 Loudly Crying Face is the odd smiley out this time, which might help explain why it is so popular among its users—and confusing to others. To the casual viewer, Apple’s 😭 Loudly Crying Face has eyes that are nearly identical to 😂 Face With Tears of Joy. If you zoom in, you'll notice that the eyebrows of 😭 Loudly Crying Face are a hair thicker and closer to the eyes, which are slightly nearer and higher up on the face. The result accentuates the waterworks but also reduces the impact of the wailing mouth. The result also yields a 😭 Loudly Crying Face that looks a little less upset than its counterparts on other platforms. 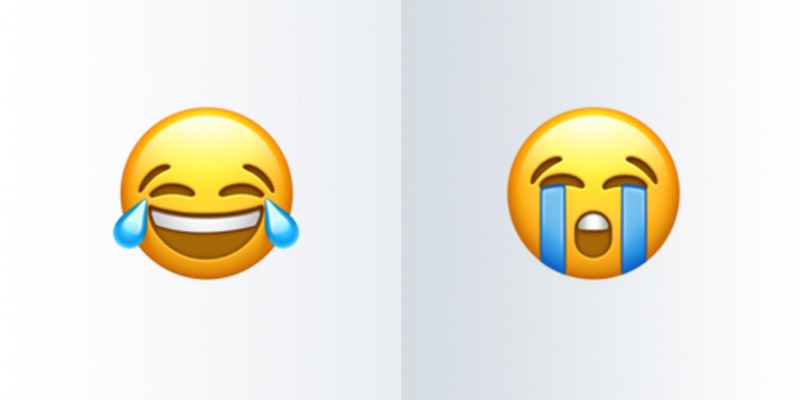 Above: At a glance, the eyes of Apple's Face With Tears of Joy emoji (left) appear the same as those of its Loudly Crying Face (right), but a closer inspection reveals subtle and important differences. Apple's design makes 😭 Loudly Crying Face available not only as a more intensive form of 😢 Crying Face, as apparently intended, but of 😂 Face With Tears of Joy as well. It's sobbing is, just not necessarily with grief but with gratitude, pride, love, excitement—with tears of, well, joy. Two other forces may be at work, however. The first is something we’ll call the reaction treadmill. In emoji-dom, 😂 Face With Tears of Joy holds court as a go-to and baseline for marking something as funny or enjoyable, keeping us running to ever more heightened and expressive ways to register strong feelings, like 😭 Loudly Crying Face. The second is that we generally favor emojis with positive emotional content. The digital realm can be a dark and nasty place, no doubt, but the data show that in our Snaps and Instas, our WhatsApps and iMessages, we like love and laughter. To wit, 😍 Smiling Face With Heart Eyes and 😘 Face Blowing a Kiss rounded out Apple’s 2017 Top Five. Besides 😭 Loudly Crying Face, the only other emojis with surface-level negativity in the Top Ten were 💀 Skull and 😩 Weary Face—whose application joins 😭 Loudly Crying Face in skewing towards the sarcastic or dramatic. thank you SO much to the thousands and thousands of sisters that came out today 😭💞 I’m so overwhelmed with joy and love!!! I’m sorry we had to run but we have a flight to catch!!! ✈️🇦🇺 be back soon!!! Whether using or interpreting 😭 Loudly Crying Face, be mindful that it's an actor with incredible range on the emoji stage, capable of comedy, tragedy, and a whole lot of melodrama. But whatever the genre, the emoji wants to make sure its voice can be heard at the back of the theater—it is named Loudly Crying Face after all. There's just no sense in scripting or typecasting what 😭 Loudly Crying Face is loudly crying about.